From Hawaii they fly to Singapore for the International Institute for Strategic Studies' Annual Shangri-La Dialogue, "Where (Panetta is) going to deliver a large sort of major policy speech focusing on the Asia-Pacific (region) and the U.S. role in the Asia-Pacific in light of the new strategy and the rebalance," according to the official. Panetta also is scheduled to meet with military leaders from Singapore, Japan, South Korea, Australia and perhaps China. "It's a good opportunity for the secretary to meet his counterparts, we'll have to see who the Chinese send," said a second senior defense official who also briefed the media. "If the opportunity is there and the schedules can support, we welcome that opportunity, as we have in the past." Much of the secretary's schedule at the Shangri-La Dialogues remains uncertain because there will be so many officials from various Asian nations, and nailing down specific meetings is still being worked out. 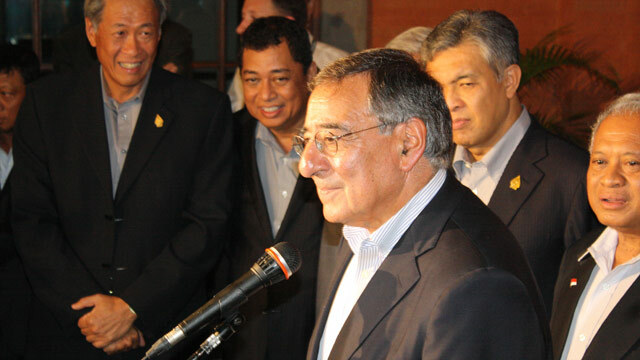 After Singapore, Panetta flies to Vietnam to meet with senior leaders from that country. "We're going to be able to thank the Vietnamese for their continual great assistance on remains recovery and other importation issues," the first official said referring to Vietnam's cooperation in finding the remains of American servicemen missing since the war there nearly 50 years ago. The United States and Vietnam have been working for some 17 years on normalization of their relations, and the official says those relations are "really healthy." From Vietnam, the secretary flies to India for his last stop. He'll spend two days there meeting with top officials in New Dehli and "he'll be giving one major speech in India as well," the official said. "India is the only country we mention in the defense strategic guidance as a partner. And we are really shifting to a point at which our defense interactions with India are becoming routine." Panetta is expected to return from the trip late next week. Here is my version....LOL !! What say you? Quoth Leon Panetta… What say you? It ain’t no visiter….so to speak…’tis me Panetta.... Evermore. When I see you hiding Evermore. And when you wake up I will be long gone…but will never be back...Never..Anymore. I will go to look for another ally...who has some balls and I will never return Anymore. This is too funny...Ha ha ha hah hah hah !!! I look forward to other versions of this poem. ROFL !!!! LMAO !!!!! Great poem. Even Rabindranath Tagore would have been proud ! Does anybody know if Panetta will be visiting the Indian army hiding in bunkers??? A poem came to mind to celebrate his visit to India. With friends like Indians we should have the Talibans watching our backs ! It ain’t no visiter….so to speak…’tis…the talibans…2 or 3 but Nevermore. And when you wake up we will be long gone…but we will be back…Evermore. Perhaps one day bollywood can make a movie of an taliban and an Indian girl love story. Leon, please look into the following and revert back to us with an update. We Americans do not want any friends with such barbaric culture. We are also requesting the US Congress to investigate this matter. All aid to india needs to be frozed till we get an explanation. Faced with potential grim prospect after United States Defense Secretary Leon Panetta’s upcoming visit to India (including a very busy schedule) the Pakistani administration is in a desperate damage control mode. I am sure it will be as one can imagine looking at one of the issues on the agenda. (1) Continued “brutal Indian occupation of Kashmir” and their right to self-determination. This guy is a bufoon. He and Hillary love to travel at tax payers expense putting mileage on the USAF planes and achieve nothing. They should be grounded and spend time working in the soup kitchens taking care of the wounded vets and homeless. I have had enough with these underachievers on my nickel. @Mark L, May I know what you have achieved in your lifetime? After all the stupid nature of your posts do not inspire much confidence. None of your business. Put your head down and start washing dishes. @Mark L/Impersonator, Are you an American in the first place? I doubt that. Again. None of your business where I am from either. “Realignment of Priorities” appears to be strong in the agenda of United States Defense Secretary’s Panetta’s present trip to Asia. Is it a spinal cord that needs to be realigned? He probably wants to get away from wife. According to stragetics,pakistan has been the deadliest country in the world. Things change,yes. However security is a concern out there. Militia insurgents are capaple of administering terroristic activities!, according to Afghanistan president at NATO meeting in Chicago. Again secretary,address child paramilitary training in India. Yes, Pakistan issue needs to be addressed and needs to be brought into the fold. India is financing terrorism bigtime there (and CIA is aware of it) besdies the homegrown elements there. Indian occupied Kashmir issue needs to be resolved. Now that you mention, I do not trust the afghan president. He is a two bit drug dealing and abusing hustler who is in bed with everyone at same time. There is a big drug trade going on in Afghanistan in which all the parties there are involved. That is why we have been there for over ten years. This will all come out in the media soon. Someone should be checking all planes going in and out of Afghanistan. they are carrying more than people and equipment !!! Perhaps Leon Panetta can address this issue of "Child Soldiers" with Indian Prime Minister. We Americans find this unacceptable. While the going is good, US should get a few naval bases on Indian territory. Make India feel good by giving it a few world war 2 frigates and have them patrol the pirates. That way they will think they are gettingthe impotrance and we get our bases. @Maria, When you think about India, consider sharing technology of nuclear powered submarines. The Russians have already “leased” one of their highly sophisticated Akula Class nuclear powered submarines to the Indian Navy besides transferring requisite technologies for India’s indigenous ones. Are you kidding. Indians can't even run the airconditioning plants in buildings and you want us to hand over nuclear technology. Easy cowboy you are not there yet nor will be in the next century. @MarkL, Educate yourself first prior responding to my post. I am no buffoon as you and I do not visit here to kill time. For the life of me I can't figure out what utility the million Indian army has for anyone!!!! What do they do except sit in trenches waiting for god knows who ! For US to support such a ludicrous country is baffling. Move on people. Bangladesh would probably give you a better bang for the buck than India in trying to do your cleanup work vis a vis China. Too little too late. The world control has slipped by US. Panetta's role is to do damage control for the incumbent in the oncoming US election. He will be gone after that. Pakistan “RISING” has established itself as part of a very dynamic regional paradigm amalgamating it geographically with Central Asia, Middle East and Europe. While also situated at the gateway to the Arabian Gulf, Pakistan will also have access to the waters of the Caspian Sea, Mediterranean Sea, Black Sea, Arabian Sea, China Sea and the Pacific Ocean. This positions Pakistan at the crossroads to peace and prosperity in the world and economic well-being as well as military clout. Pakistan isn't on the list?